Born in Amriswill, Switzerland, 23 September 1909, Straub studied weaving at the Kunstgewerbeschule in Zurich, (1928-31). She then completed her technical training at Bradford Technical College, (1932-33). After leaving Bradford, Straub worked briefly for Ethel Mairet in her handweaving workshop in Ditchling, Sussex and the two maintained a friendship from then on. In 1934, Straub was employed as a consultant designer for the Rural Industries Bureau in Wales. In 1937, she became head designer at Helios, an independent subsiduary of the Lancashire firm Barlow & Jones Ltd, where she remained until 1950. In 1951, Straub was actively involved in the Festival of Britain and provided fabrics for the Regatta Restaurant, at the Festival’s South Bank site in London. Several fabrics designed by Straub for Warners, including Broadstairs, were commissioned by Misha Black of DRU, mainly for use in the interiors of ships, such as the SS ‘Oriana’ in 1960. According to Lesley Jackson, Straub became known for her ‘enlarged, free form organic pattern’, (Jackson, 2007). In 1964, she designed upholstery fabric, which was later used on the Piccadilly Line and on London Transport buses. Straub taught at many UK art colleges including Brighton, Huddersfield and Liverpool during the 1960s. In 1972 she was made Royal Designer for Industry (RDI) by the RSA and awarded the Sir Misha Black medal in 1993. She was a Fellow of the Society of Industrial Artists and Designers (SIAD). Marianne Straub died on 8 November 1994. Marianne Straub, Hand Weaving and Cloth Design, 1977. 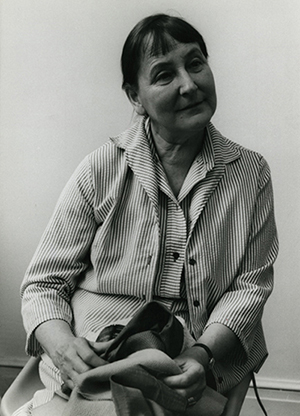 Mary Schoeser, Marianne Straub, 1984.